A couple of weeks ago, I made one of my regular trips to Scotland. As usual, I had two stopovers in the way to my final destination of the Aigas Field Centre. The weather turned out to be about the most favourable so far. I’ve had good weather in the past, but it was too good, with very harsh lighting. Often though, the weather has been pretty wet, with a low cloud base. This time however, it was pretty much perfect for a landscape photographer, at least on most days. While there were some wet periods, on the whole, it was showery, with constantly changing lighting conditions, with just one day being extremely wet (complete with flooding). As has become fairly standard over the past few trips, my first stop was at a small Lake District village called Watermillock at the Brackenrigg Inn, which overlooks Ullswater to the south. The single rooms are quite small, but the food is among the best I’ve tasted. Often, the weather in The Lakes is pretty wet and there was some flooding when I arrived, but the sun was shining, with enough cloud cover to give some interesting skies. I dutifully drove down to Pooley Bridge and walked along the southern bank. It wasn’t quite as straightforward as I’d expected though, due to the flooding. Firstly, I tried photographing the river in flood, but I couldn’t get a composition I liked, so I continued to the southern bank, where I’d photographed before, ready to capture the sunset. The path I had taken before though, was completely flooded, so I had to take the higher path, until I could find a place to descend back down to water level and away from the trees. The flooding in my chosen spot was obvious, with a number of trees surrounded by water. The sunset wasn’t the best, but I managed to get some shots I was happy with anyway. My next stop was one of my favourite places, Glencoe. As usual, I stayed at the Clachaig Inn, near to Signal Rocks and next to the River Coe. It is a prime place for ramblers and mountaineers, so has a much more informal feel to it that I like. The food is more pub-style, than restaurant, but still pleasant to eat. Again, the weather was perfect for landscapes and I was able to get one of my favourite images of the year. The sun broke through the clouds, lighting up the surrounding mountains, leaving the River Coe in enough shadow for me to reduce the shutterspeed enough to get good motion of the water. After just a single night at the Clachaig, I drove to my final destination, the Aigas Field Centre. I’ve seen a few changes amongst the Rangers over the years, but they are all very friendly and knowledgable. The food is also very good and there is always plenty for even the largest of appetites and the centre is worth a visit, just for that. It has become my escape from a busy and stressful working life and is now pretty much a second home to me. If I lived closer, I would probably visit more often than I do, but the drive is simply too long for more trips. As usual, my reason (or rather excuse) for going was a masterclass photography workshop that was being run by the renowned Scottish nature photographer Laurie Campbell. Even though, I probably don’t really need his tutelage anymore as such, I always pick up some piece of useful information, simply by his proximity and by seeing him at work and he has become a friend over the years. The Masterclass Photography workshop, is as much about learning fieldcraft as photography and it is this that is one of my main reasons for attending. Another important reason, is to visit areas I like to visit, have time to stop photograph and not have the stress of driving long distances. The Aigas Estate is also well worth a visit, with a large range of different habitats and wildlife. In the spring and summer, it is possible to see ospreys and other raptors on the estate, as well as many different small passerine birds, with various wildfowl and other winter birds arriving in the autumn. There are also a number of resident mammals and herpetic fauna, including pine martens and badgers, not to mention red squirrels. I have spent around four and a half years trying to get a photograph of red squirrel I am happy with, with very little success. However, on this trip, they were very visible, with a number of youngsters running across the lawns around the arboretum. With a little judicious baiting, they performed admirably and at one point three different individuals were in close proximity. There are a number of local straths and glens surrounding the field centre, including Strathconon, Glen Cannich and the more famous Glen Affric and Glen Strathfarrar. These are all good for seeing golden eagles and each has their own landscape. Glen Affric is known for the remnant caledonian pine woodland and has special recognition for its importance in the natural habitat of the Scottish Highlands. Very few other glens and straths can offer such a fine example and once the autumn colours are produced, it is nothing short of breathtaking. Sadly, we were a little too early to see it at its best, as the colours weren’t yet in their full glory, but a visit to Strathconon produce some better colours. Stathconon is the complete opposite to Glen Affric in some ways. It is a good example of imbalance in fact, as the forestry commission has a strong presence and there is alot of evidence for overgrazing by red deer, with quite alot of erosion of the slopes. However, the colours around Loch Meig, near the bottom of the glen were just getting to their best and the almost still, sunlit evening made for some spectacular reflections, so much so, that we were late for dinner. There was just enough of a breeze to blow the leaves, without disturbing the water. 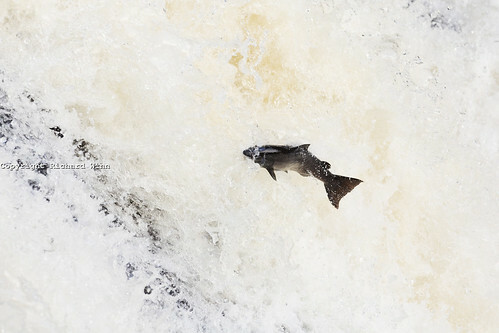 We also went a little further afield, visiting the Falls of Shin, to see the leaping salmon and trout. Numbers weren’t large, but there were enough for some photographic opportunities. Another trip took us along the Farr Road, ostensibly to look for signs of black water voles, but also to look out for red grouse and to see some ancient preserved pine roots, evidence of how the moorland once looked, before human intervention. Finally it was time to leave and to say goodbye to some friends in their final season at the centre. Unfortunately, I had left it too late to book a room at the Clachaig Inn for a couple of nights, so I was forced to look for another stopover. I chose the Isles of Glencoe Hotel, a pleasant hotel in a prime location, on the banks of Loch Leven, at the bottom of Glencoe. While the room was very nice and the food was good, it was a little too formal for my purpose, as I wanted to eat when I was ready to eat, instead of having to plan when to have dinner, early in the day. The locale was spectacular though and the changeable weather made for some dramatic landscapes. I produced a number of images I was very happy with, but one in particular stood out for me, making it two standout images for the trip. The final day, as I was just finishing my breakfast and was about to go and get ready for the drive to Ullswater, the mist started rolling across the loch from the direction of Kinlochleven. I quickly grabbed my gear to a high vantage point overlooking the loch, deciding on a short telephoto lens, grabbing a number of shots, looking towards the nearby mist beyond Eilean Munde, before heading towards another vantage point looking towards Ballachulish Bridge. Finally, I headed off back to Ullswater, where the weather had closed in, so it was a restful night at the Brackenrigg before I headed home, from what had been a very successful and enjoyable trip, with a number of significant images.